Q. How do I get Google Scholar results into Endnote? 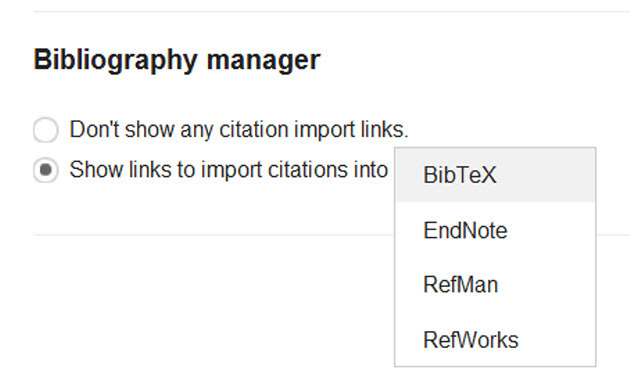 Google Scholar works with some of the main reference management software packages. First, you need to set your Scholar Preferences. To begin, click Settings (icon at top right of screen, as shown below). On the next screen, scroll down to the bottom and select the reference software you are using. Remember to click Save preferences before proceeding. Now when you run a search on Google Scholar, each result will have an "import into ..." link beneath it (in the screenshot below, RefWorks has been chosen, but it could be any of the other options in the screenshot above). You will need to click on each reference you want individually - you cannot import a number of references at once, as is possible with DISCOVER and other library databases. More information from the Referencing guide. IMPORTANT: See further information about which version of RefWorks to use.